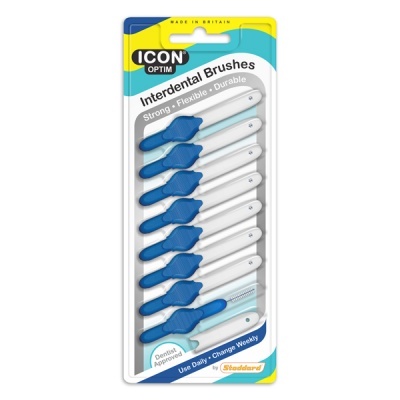 Stoddard ICON interdental brushes are specially designed to clean thoroughly in the wider spaces between teeth and around braces and bridges. They are vital for the prevention of plaque build-up and will help in the promotion of healthy teeth and gums. Use your brush as part of your daily dental hygiene regime. Stoddard ICON interdental brushes are manufactured using only the highest specification materials. High tensile strength, plastic coated, stainless steel wire at the core prevents the brushes from bending. For longer life the bristles are made from the same memory retentive nylon as used for toothbrushes. The brush is locked into the handle using a revolutionary production process making it virtually impossible for them to separate.